Welcome, and please, don’t be afraid to come in! This corner of our shoppe has everything you need to put the finishing touches on your costume. After you’ve decked yourself out in medieval clothing for your next renaissance fair or reenactment, be sure to stop in and browse through our wonderful collection of medieval accessories. I can see you’ve just purchased some breeches, but how are you going to keep them around your waist without a belt or sash? And you, Miss – your new dress is beautiful, but you don’t want to go out amongst the peasantry without your medieval hat or veil, do you? 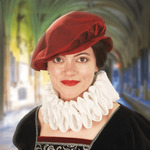 Why not add that extra bit of style and personalization to make your renaissance costume stand out from the crowd? You can find all of the authentic renaissance accessories you need at Pearson’s Renaissance Shoppe!